This setup is a lot simpler, than it seems in Tomb Raider - The Last Revelation. If you open the level which uses it (The Great Hypostyle Hall), you will see a very complex construction of rooms oriented in certain directions and in several level heights, with the objects needed for the setup placed in specific ways in relation to each other. None of this is needed at all - in the first test I made of this setup, I put everything into one room to see what would happen. To my great surprise the setup worked perfectly. 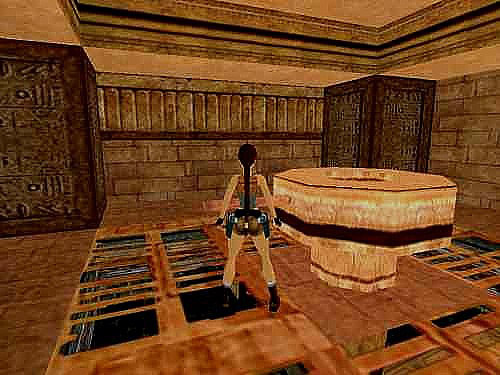 For those who haven't played The Last Revelation or have forgotten how this setup was operated, Lara must turn three horizontal obelisks so their tips point to a pyramid-shaped cage containing a puzzle item she needs. Near the cage is a pulley she can't operate until all three obelisks point towards the cage. In the level Lara has to climb to a series of upper rooms to turn the handles that control the obelisks. When she finally operates the pulley, a cutscene shows great hammers suspended behind the obelisks being released and hitting the obelisks. 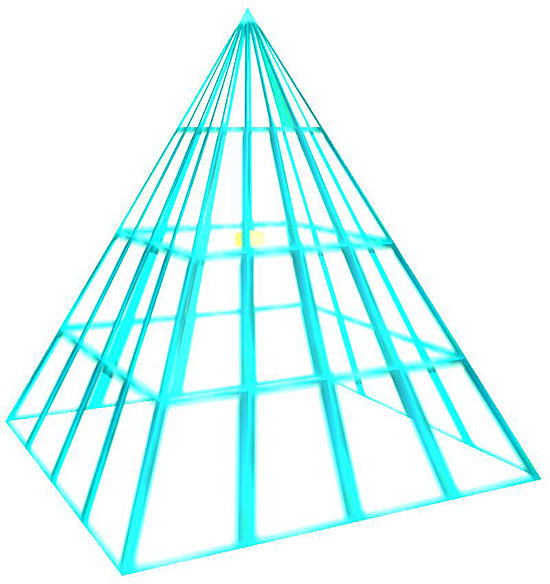 This causes the obelisks to emit yellow sparks which reach further and further until they touch the pyramid-shaped cage. The cage then explodes and gives access to the puzzle item. The setup has two stages. The first stage is about unlocking the pulley. 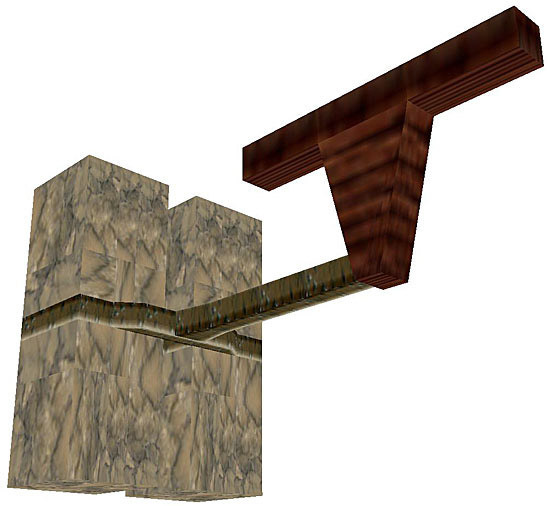 A level builder who wants to may use this stage without stage two as an individual puzzle. Please note: the four points of the compass: north, south, east and west, refer to the orientation of the 2D editor window. North is the top of the 2D editor window and west is the left side of it. PULLEY - can be found in several Wad's: The Tomb of Seth (settomb), The Lost Library (library) and Cleopatra's Palaces (cleopal). The rope for the PULLEY. This is a static. In The Tomb of Seth it's FURNITURE0, in The Lost Library it's DEBRIS4 and in Cleopatra's Palaces it's FURNITURE7. 1. Place the pulley (it must be the first PULLEY you place in the level), open its Object Code Field (press O), give it OCB = 1 (to make Lara pull it only once - mostly for cosmetic reasons, so you can skip this if you like) and press the 'invisible' button. Here comes the strange thing: the 'invisible' PULLEY is still visible but Lara refuses to use it. It can't be triggered usable. Only solving the first stage of the obelisk puzzle unlocks it. This is the only kind of switch which behaves this peculiar way. 2. Place a switch-trigger for the PULLEY under the PULLEY itself and press the one shot-button (again mostly for cosmetic reasons - Lara can only trigger the other objects once, and it looks silly to have her pull the PULLEY several times when nothing comes of it). Place the triggers for the objects to be triggered. 3. Place three Obelisks. You can put them anywhere you please - scatter them around the entire level or keep them in the same room. An OBELISK is seven (7) blocks long, so each must have an area of 7 x 7 blocks to have room for its rotation. The Obelisks must have the OCB-codes of 1-3. It is of no importance in which direction they are turned before Lara begins to operate them. Turn them as you please. 4. Place three TURN_SWITCHes. On the same block place a trigger for one of the three Obelisks and a switch-trigger for the TURN_SWITCH. That's all. No special OCB's or anything. Each TURN_SWITCH is linked to its OBELISK in such a way that the OBELISK will turn in the same direction and pace as Lara turns the TURN_SWITCH. OK, it might be a good idea to orientate the TURN_SWITCH the same way as the corresponding OBELISK, so the handle of the TURN_SWITCH points in the same direction as the tip of the OBELISK and thus gives the player an idea of what way to turn the switch. But it isn't mandatory. Be cruel if you like (but don't expect good reviews then). Just note that the only thing the TURN_SWITCH is able to trigger is an OBELISK. If you place any other triggers under it, it will not work. You can also place the TURN_SWITCHes anywhere you please. They don't have to be in a room above the Obelisks, even though Core Design had that intention when the setup was made. So when Lara operates one of the switches, the camera raises above her and gives the player a view of the floor under her and the switch - and whatever might be below, if the floor is transparent in some fashion. 5. Now is the time for a hint about what way each OBELISK (and each TURN_SWITCH) is to be turned. This is one of the hardcoded conditions to make the setup work. Each OBELISK has a specific direction it must point to when turned correctly in game. When Lara has turned them in these directions, the PULLEY is then usable. It's up to you how to give hints to the player. Perhaps it's evident that the bottom of each OBELISK must be turned towards a HAMMER but if you don't use the second part of the obelisk setup the HAMMER's aren't needed, and you will have to come up with another way of hinting at the correct direction to the player. Once you have done that, the setup is ready to be used. This setup can only be used once in a level. And the level can only contain the three OBELISK's for this setup. More OBELISK's in a level will simply prevent the PULLEY from ever being unlocked. Only one PULLEY can be unlocked. 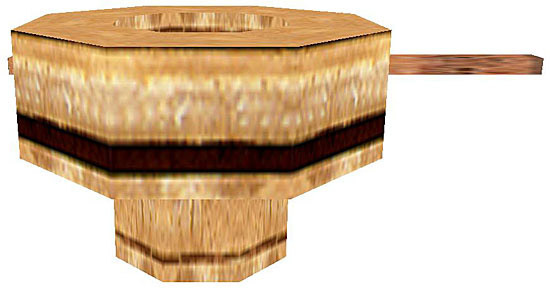 When Lara makes a jump from one level to another or jumps within the same level (by using a finish-trigger), the TURN_SWITCHes will be reset to their original orientation but the OBELISK's will keep the direction the player had already turned them in. This will do the player's head in, so to avoid insane players (and binned levels) make sure the player doesn't have the possibility to use a finish-trigger before the obelisk puzzle has been solved and the PULLEY has been operated. ANIMATING3 - the cage, which contains the puzzle item. Note that it is made with an imitation of the PUZZLE_ITEM1_COMBO1 suspended in the air. I assume you want to duplicate the original arrangement from The Great Hypostyle Hall, where the OBELISKs point to the ANIMATING3 and their sparks reach it - there is almost no other way to do this if you also want the look of the puzzle. 1. The ANIMATING3 is the centre of the setup. Each of the three OBELISKs must be placed eight (8) blocks away from it for the sparks to reach the ANIMATING3. Note: an OBELISK is placed on the block its centre/suspension is located over. In this tutorial I don't think of the extra six blocks it covers. Thank you to Bedazzled for ripping the original setup and making it easier for me to figure this. 2. Place three HAMMER's. Each of them must be three (3) blocks away from its corresponding OBELISK and placed where the OBELISK will have its bottom when it has been turned in the correct direction. 3. Now comes the mystery of the OCB-codes for the HAMMER's. Only one OCB-code is needed: OCB = 2. In the original setup the two HAMMER's with OCB = 1 and OCB = 3 are never triggered and thus never used. But because the OBELISK's block the entrance to their rooms, the player can't see this. You can leave those two HAMMER's out if you please. Their presence is not needed to cause the sparks and exploding ANIMATING3. If the player is able to see the HAMMER's after the use of the pulley you better give all three of them OCB = 2 so they all behave the same (drop, hit the OBELISK's with an explosion-like sound and stay down). 4. Place the triggers for the HAMMER's under the PULLEY. 5. Place the PUZZLE_ITEM1_COMBO1. This is crucial. If the PUZZLE_ITEM1_COMBO1 is missing, the game will crash when the ANIMATING3 explodes. But is doesn't have to be placed under the ANIMATING3 - or even in that room. You can place it anywhere in your level and make Lara find it at a later point. Actually, you can even have Lara find it AND use it, before she ever reaches the obelisk puzzle. The game engine only requires that it is located somewhere in the level when Lara first enters it. It doesn't have to be invisible either. That doesn't seem to bother the game engine. But if you want to be safe, you place the PUZZLE_ITEM1_COMBO1 in the level after the obelisk puzzle and make it invisible. When Lara then solves the obelisk puzzle, it's made visible by the game engine - no trigger is needed. Of course, if you want to be all safe, you place it under the ANIMATING3. But as I have just shown, you can easily use this puzzle for other pickups. It lasts a few moments after Lara's use of the PULLEY and before the ANIMATING3 explodes. Core Design used these moments for a cutscene. But you can just let the player watch, how the sparks from the OBELISK's grow longer until they reach the ANIMATING3. Once the ANIMATING3 has exploded, Lara can no longer operate the TURN_SWITCHes. She is able to grab hold of the turn bar, but is unable to turn the switch. Core Design probably wanted it to seem realistic with the dropped HAMMERs now locking the OBELISK's in place. You can use any object in the ANIMATING3-slot. But an ANIMATING3 must be part of the obelisk puzzle, or it will not work.